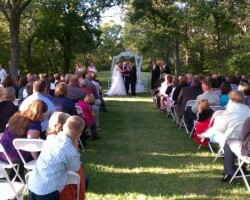 Beyond Illusion is a company that represents two highly experienced Omaha wedding officiants. Rev. 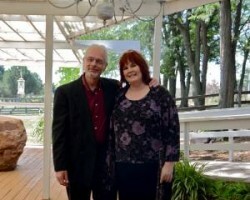 Thomas and Susie Joyce are a couple themselves, with over 400 weddings officiated. When you work with this company, you can choose one or both of these experts to come up with a unique and beautiful script for your ceremony. They will meet with you before the big day to outline the script that you want and then will be available at all times for open communication and questions. Working with Edwin ‘Hersh’ Rodasky means having a ceremony that you are completely in control of. You will be able to hire this expert and collaboratively come up with each detail of the script. You can include special poems and reminisce about specific moments in your relationship. As a highly sought after wedding minister in Nebraska, Edwin will also make you feel comfortable and ready for the most important day of your life. This expert is available for all kinds of ceremonies too including religious or civil. What makes Chaplain Royal a great wedding officiant is the personalized attention he gives to each couple and the detailed approach he has when organizing a ceremony and writing a script. 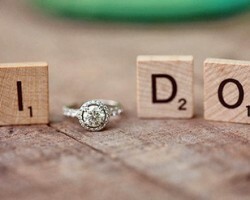 He never uses a standard set script or one that was developed for another couple so you can be sure that your wedding day will be completely unique and customized to your love story and your beliefs. One of the best aspects of this officiant is that he is able to perform ceremonies of all kinds from religious to non-denominational and everything in between. When you would like to work with a wedding officiant in Omaha, NE that clearly cares about their work and is passionate about helping each client, you should seek the services of I Choose You Ceremonies. 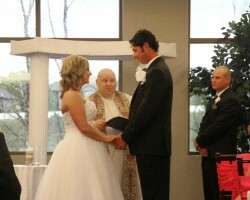 This company is known throughout the area for having the most professional and attentive officiants in the business. Seeing their role in your wedding as an honor is what drives them to create completely custom services that suit your style and your specific love story. RK Designs is a service that specializes in ceremony and vow design. This company will walk you though all of the options to make sure your wedding ceremony is as unique as you are as a couple. The licensed officiant will be there with you well before the big day and will remain in contact so you can always request changes or discuss the details. Reviews of this company rave about how well they care for their clients before, during and after the ceremony.